is Soroptimist International of Ashland's Signature Project, initiated in September, 2008. This project is designed to develop leadership and confidence in academic strengths in Math and Science for girls K-5 by strengthening self-esteem and problem solving ability. This project involves reading, communication, science, career awareness, and stewardship of the environment, and targets girls who will benefit from more adult, small group intervention and support, though is open to all girls. Once a month, on the 1st, 2nd, or 3rd Thursday during the school year, have lunch with a girl from the grades 2-5 at Helman Elementary School. By providing your undivided attention to this young person for 1/2 hour each month, you WILL make an impact on her, though in unknown ways. We have seen growth in self-confidence and a broadening of future dreams in girls over the past 5 years. If you are interested in becoming a woman who wants to make a difference in the life of a young girl, contact Bea Bacher-Wetmore at (541) 708-3835. 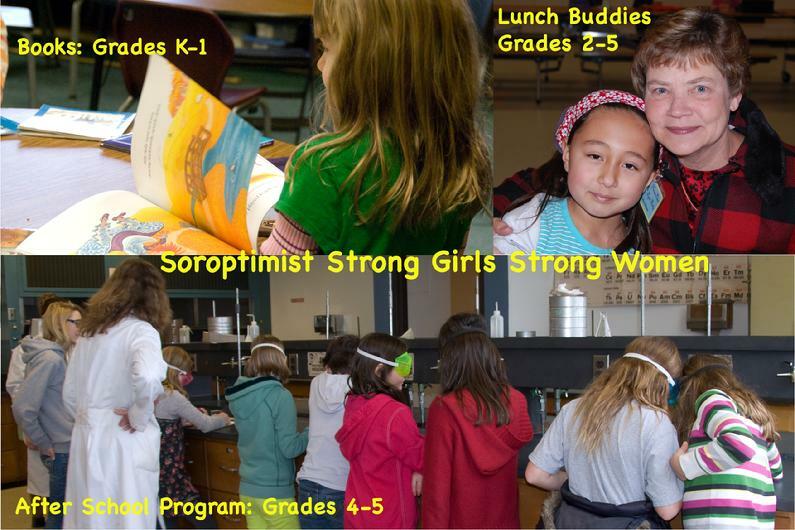 Every girl in grades K-1 will select a book with a strong female character as a gift from Soroptimist, including a book plate personalizing the book. In addition, a few girls will be selected that would benefit by the donation of a small bookcase and a small library of grade-specific books, to encourage a life-long love of reading. The book cases are made as a Senior project by two Ashland High School students. Click here for BOOKS & BUDDIES video. Every girl in grades 2-4 who elects to participate will have a Lunch Buddy, a woman who will have lunch with the girl once a month on the first, second, or third Thursday. These women come from Soroptimist, AAUW, and the community at large, with an interest in supporting the development of young girls. The girl's exhibit increased confidence and delight in the developing relationship with someone who gives her undivided attention for this brief time each month. Fall Program: exploring science, math, and communication with dynamic teachers. Winter Program: explores careers through field trips to see women in exciting and interesting jobs. Past field trips have included the Forensics Lab, Animal Shelter, Women-owned businesses in downtown Ashland, SOU women's sports. 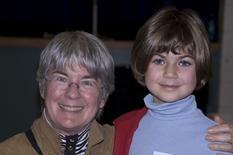 Spring Program: environmental stewardship and ecology. 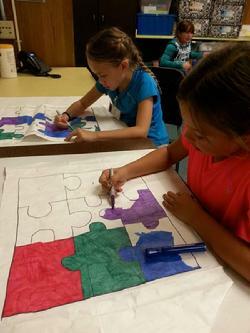 Fourth-graders Mia Snow, left, and Alex Dorr making kites. This attached article tells us that mentoring is "the best way to make a difference in education."